For those seeking to study the history of 20th Century Cuban music, there are many extraordinarily rich resources, but just as many areas about which there is infuriatingly little information available. The purpose of this section is to provide links to the treasures, to try to fill in some of the gaping holes, and, most important, to ask you, the reader, to add to this site by sending in new information. There are several monumental bodies of knowledge which will allow the reader to quickly and enjoyably assimilate the readily available knowledge, and in doing so, to gain a clear understanding of the areas that need to be filled in. In my mind, there is only one logical starting point: Ned Sublette's epic Cubacentric history of the world and its music, Cuba and its Music: From the First Drums to the Mambo. The only problem with Sublette's masterpiece is that it's a two-volume set with an indefinitely delayed second volume. It begins centuries ago in Africa, and ends abruptly in 1951, the same year, perhaps not coincidentally, that Arsenio Rodríguez left Havana. There are several extraordinary treasures of information which serve as perfect companions to the study laid out so compellingly in Cuba and its Music. First, we have the online discography of Cristóbal Díaz-Ayala, which lists and organizes nearly every Cuban recording up to about 1960. This is an endlessly valuable resource. Second, we have the record label Tumbao Cuban Classics. This company has the most organized releases, the best documentation, and excellent audio transfers from the original 78s. Tumbao Cuban Classics is the first stop for the recordings of Sexteto Habanero, Arsenio Rodríguez, Beny Moré, and the other great pre-Revolution Cuban recording artists. A eagerly-awaited 6-CD box set covering the most important recordings of Arseniio Rodríguez is planned should be out sometime in 2007. The extensive documentation has already been written by David F. García, author of our third indispensable resource. David F. García's biography of Arsenio Rodríguez is the most complete resource on the blind tresero and composer who is inarguably the most important pre-revolution Cuban musician. It adds important data and musical analysis to Sublette's coverage and also continues on past 1951 to the end of Arsenio's career in the early 70s. Another great Arsenio resource is collector-radio host Emiliano Echeverría, here at timba.com, and broadcasting on radio and online for KPFA. The fourth key resource is this website, timba.com, which began its foray into the "pre-timba" era with an intensive study of Arsenio Rodríguez's bass tumbaos, bloques and arranging techniques, and has now added a similar section on the songo era, including Ritmo Oriental, Los Van Van and Irakere. Timba.com is also by far the world's largest resource for information on Cuban music from 1989 to the present. Particularly expansive are our sections on Charanga Habanera, NG La Banda and Manolín, but we also have vast archives of audio, video, interviews, biographies, photos and tour information on nearly every important post-1989 group, with extensive articles by many writers, including myself. In addition to my writing for timba.com, I've co-authored three books, The Tomás Cruz Conga Method, Volumes I-III, which, while primarily devoted to conga rhythms, also include a significant amount of historical information and commentary. That leaves a giant gaping hole of three decades from the Cuban Revolution (1959) to the beginning of the Timba Revolution (1989). 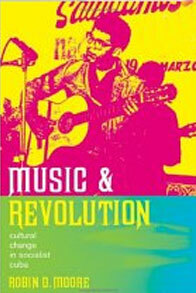 Robin D. Moore's Music & Revolution is a good start, dealing primarily with the socio-economic and cultural aspects of music in socialist Cuba, but doesn't get into the chronological history of the recordings themselves. What hasn't been published anywhere, even in Cuba, is a satisfactory history of the groups and recordings of this fascinating and mysterious 30 year period. In late 2007 we took steps to fill the gap with our Roots of Timba series, and the discographies in this section. The reader is strongly encouraged to write, email and call each of the addresses provided for Cuba's state-owned record company, EGREM -- preferably en español -- and make it clear to them that there is interest in remastered reissues of their entire catalog, as well as a discography, perhaps in coffee table book form, with the dates, personnel, and hopefully artwork of all of the important. Unless EGREM takes this project on, it's likely that vast quantities of great music will be lost forever and that future generations will have a wealth of information on the Cuban music of the 30 years preceding the revolution and very little on the 30 years that followed it. Feel free to paraphrase our Open Letter to EGREM.